Big League Clu turns his attention to the Big 12 Conference college football season. A few years ago, I might have said that this conference was the strongest in the country, with schools like Texas, Texas A&M, Oklahoma and Nebraska. Unfortunately, the Big 12 was also one of the conferences affected by that super conference purge as well. It lost Texas A&M to the SEC, Nebraska to the Big 10 and Colorado to the Pac 12. They did manage to add teams like Texas Christian University and West Virginia to help balance out and remain BCS eligible. With all that being said, lets see what the Big 12 has to offer this year. Having gone to three consecutive bowl games (most in school history), BU is looking to continue that trend of success in 2013. They are also trying to post their fourth consecutive winning season for the first time since they did it from 1985-88. Taking the reins at QB is Bryce Petty, who is just 10-14 passing in his entire career. Thats right… 10 passes! Let’s be honest though, I could probably throw for 3,500 yards with this Baylor offense around me. It doesn’t hurt that Petty is built like a tank. He’s solid, athletic and has a cannon for an arm, so he should be just fine. The Bears have averaged 572 total yards per game the last tow seasons, which has been good enough for second in the nation both years. The faithful in Norman, Oklahoma have a QB controversy for the first time in what seems like forever! With the departure of star QB and record holder (of almost every single record at OU) Landry Jones to the NFL, the flood gates have opened up. Sooners head coach Bob Stoops announced that no decision on a starting quarterback has been made, despite rumors from local Oklahoma City TV stations saying that freshman QB Trevor Knight has won the starting job. But let’s not just focus on the QBs. 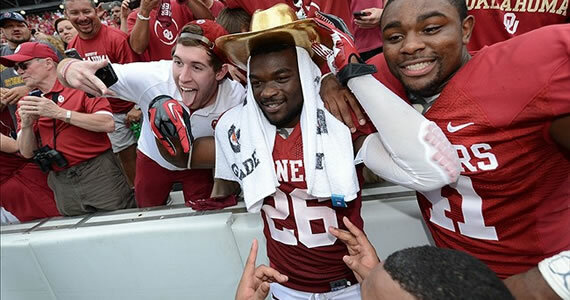 Oklahoma looks to see a huge impact from RB Damien Williams (1,266 yards of total offense, 12 TDs last year), as he will be the anchor on offense. Since we’ve talked about the Sooners, why not talk about the Cowboys too, eh? There’s definitely a lot of high expectations at OSU for the 2013 season. They had one of the best passing attacks last season, ranking seventh in the nation. That passing offense helped them score 45 points per game, which was good enough for third in the nation! I mean if my team had stud WR Josh Stewart on it, I would be living on easy street too. Stewart had some monster numbers last season, hauling in 101 passes for 1200 yards and 7 TDs. Let’s not forget senior QB Clint Chelf, who is looking to build off of last season and flex his muscles too. If the Cowboys have one achilles heel, however, it’s their defense! OK State gave up 28 points per game last season, which is terrible. They did replaced a good amount of players on the defensive side of the ball this past off-season, so we will have to see if that shows on the field. They seem like a confident bunch of guys, which should help them come Game Day. The Longhorns appeared in the national championship game in 2009. 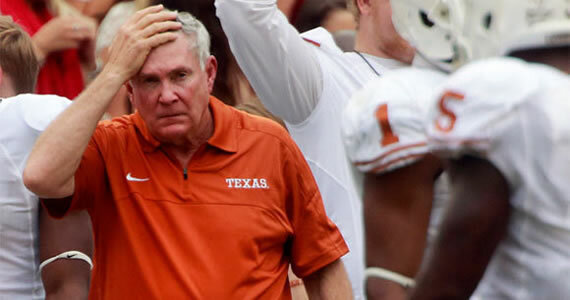 Since then, head coach Mac Brown has been driving himself crazy trying to find a winning formula at Texas. It’s not that his teams have lacked talent, either. They just can’t seem to win enough. This year looks to be different though. They finally have a solid starting QB in David Ash, who boasted a 153.3 passer rating, 2,699 yards and 19 TDs last season. Ash helped the Longhorns get back into serious contention, and even won the Alamo Bowl last year. It will be interesting to see what Texas can do this year. They bring back 19 starters, which will be a key to keeping their momentum going for 2013. They will need to improve on defense this year, as they ranked 79th in the country in points against. 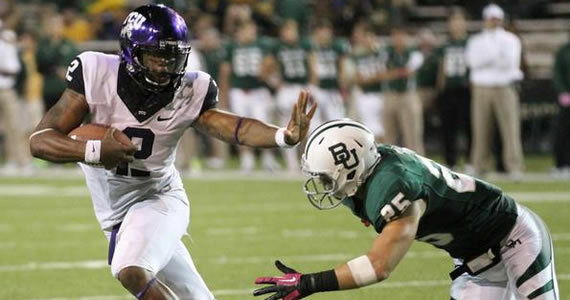 After a rocky start in their first season in the Big 12, the Horned Frogs look to be on the rise in 2013. There was no doubt in my mind that, when TCU decided to jump ship from the now defunct Big East (a move that made a lot of sense), there was going to be a big learning curve to overcome. They responded with a respectable 7-6 record, but there is still much to improve on for these Horned Frogs. They open up the season against a daunting SEC foe in #12 LSU, but hey, that is the way of life if you want to play in the Big 12. Now onto some important info about these 2013 Horned Frogs. There’s a QB controversy that, going into the first week of the season, has yet to be resolved. If either Casey Pachall or Trevone Boykin (the QBs in question) are going to have a shot of keeping this TCU team successful in the Big 12, the offensive line needs to give them better protection. In the six losses they had in 2012, the O-line gave up 3.5 sacks per game. I am sure that doesn’t sit well with anyone on the coaching staff, or any of the fans. Even when they do finally decide on a QB, there’s the question of who is going to be the go to WR left to answer. It appears that junior wide out Brandon Carter, who had 36 catches for 590 yards and 6 TDs in 2012, looks to be TCU’s top guy. There is one major positive for this TCU team, and that is that their defense essentially brings back nine of the eleven starters from last year, which means that an already a solid defensive core should get even more dangerous.